I'm writing this post from the UK on our annual summer jaunt to visit friends and family. Even on our holidays I still can't help looking out for all things yarn related. We visited Gressenhall Farm in Norfolk this week and I was delighted to find that they had rare breed animals including Norfolk Blackfaced Horn and Leicester Longwool sheep. Lovely! It's always hard not to splurge in the museum gift shop and I bought a book Rare Breeds by Lawrence Alderson and have been educating myself further. The author writes that Great Britain has been known as the "stud farm of the world" and last month I was talking to two vendors at the Houston Fiber Fest about their British sheep exports. The owner of Lazy Cat Yarns showed me her wonderful Infinity yarn, a blue faced Leicester blend yarn from the UK, telling me that it had more shine and drape than Merino. Lynda the farmer from Foggy Hollow Ranch spoke to me at length about her cherished fine Shetland sheep while I looked and felt fantastic raw fleece from her flock. My dreams of living on a farm someday continue..... We are traveling around the UK by train partly because I love looking up from my crochet at the fields of fluffy sheep. A comparison of merino vs blue face Leicester on the Can't talk, I'm dying blog. 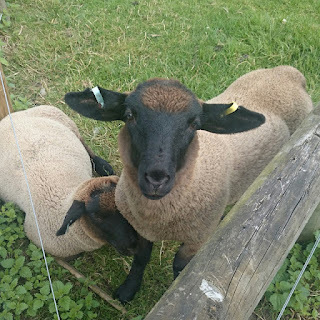 Photos and descriptions of Rare and Native Breed Sheep on the Rare Breeds Survival Trust website. A marvelous list of places to buy British Yarn on the Woolsack website. Apologies for posting initially without embedding my links.The blogger app doesn't give me that feature - I'm traveling light(ish) and left my laptop back in Texas. Update - I now have access to a laptop so all sorted. Until next week, craft on!